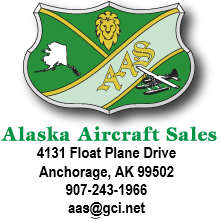 Alaska Aircraft Sales has three certified aircraft appraisers on staff, including one with USPAP certification. They are all members of the National Aircraft Appraisers Association and between them represent more than 85 years of experience in the aviation industry. Lending agencies, attorneys, courts and insurance agents all recognize NAAA appraisals for determining fair values of aircraft. Our appraisers have completed over 350 appraisals and have been used as expert witnesses in multiple court cases. We can travel anywhere in Alaska to fulfill your needs, although a travel fee may be required. No aircraft of modification is incapable of appraisal: “Alaskan, Antique or Unique” – everything has value, and we will find it for you. Please fill out the form below and press submit & a representative will contact you. If you have further questions, please contact us at aas@gci.net or 907-243-1966.